Pretentious Title: SPIRIT WAR RAFFLE - Day 1 Winner! Woo! We had some awesome entries! Have I mentioned how amazing you guys are? AMAZINGSAUCE! I've entered all the entries for yesterday into my magic spreadsheet and, the randomly selected winner for Day 1 is.... The Superhero Princess!! HOORAY! 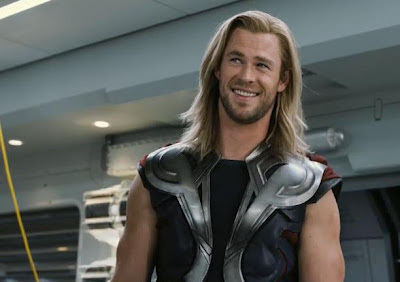 I will now use your name as an excuse to post a picture of Thor! Hey Chris, come play Josef, would you? AHEM, so, The Superhero Princess, if you would please contact me with all your details like where you live, whom you want the book made out to, and which book, omnibus or Spirit War, you would prefer, I'll get you shipped off! For everyone else, don't worry! There are still 6 days and the grand prize left to go! Today is a fresh day, so feel free to repost and get your name in the hat again for more chances to win. Also, everyone who posted yesterday is still in the pot for the rest of the prizes! Don't forget to post your entries on the original thread (rules are there too) to make sure they get counted! Congrats again, and thanks so much for spreading the word! See you all tomorrow for the next winner! And -- Love the picture of THOR. My husband and I went to see AVENGERS opening night and we were ecstatic!